The title and sales tax on the A6 wasn't bad at all, considering you don't pay property tax on vehicles Colorado looks like a steal compared to Missouri so far! We were told the license office was open till 5 but only took people until 4pm, it was 4pm when we finished up at the DMV but we headed over to the license office to try anyways. Yikes, this place was a madhouse, there must of been 60 people in there waiting, we thought there was no way we'd get out of there in a reasonable amount of time. We were done by 5pm, in and out in 50 minutes, not too bad! My license cost ended up being $23, $21 for Natalie, an extra $2 for the motorcycle endorsement. Saturday morning I got up and headed off to Boulder with the F250 to pick up an RX-7 for a buddy of mine. This car was an 89 GTUs that had a minor problem of being stuck in reverse. The previous owner had a buddy who tried to fix it, but wasn't able to, so I made them put the stick and center column back together before I took off with the car on the trailer. Little did they know I had planned on having the car driving normally by the afternoon. On the way home from Boulder I decided to check out a junk yard to see if I could find any parts for the Audi. SCORE! I got a much needed door speaker, bulbs for the AC controls that were out, and a radiator expansion tank for $10.49. Now I can send the other expansion tank that came broken from Amazon back and save $50! When I got home I climbed under the car trailer and spent about 50 minutes wrenching on the RX-7, I ended up having to get Natalie to sit in the car and shift to see if things were working. It was a rather easy fix, the biggest pain was just trying to get access to the proper part of the transmission. I took the car for a spin around the block to make sure it was working before I loaded it back up on the trailer and taking it to storage to wait for John's transport company to come pick it up. After working on John's car it was time to finally work on mine, so I got the door speaker fixed in the Audi and messed around with fixing the rattle in the driver's door. I started to work on putting the subwoofer in the Audi as well but didn't have the drive or parts to finish it all on Saturday. I did head off to Autozone to look for some wiring, when I went to leave I noticed the headlights weren't on in the car. I stopped in the parking lot and turn the switch on, oh wait, it already was. So I turned off the car, turned it back on, nothing. Turned off the car, turned it back on, no lights but the heater fan was making some funky noises. Attempt #3, boom lights work all is well. Gremlins! Fast forward to Sunday morning, I get up and put the subwoofer in the car, no major issues there except that I find a mess of wire in the dash for the radio. The JVC head unit in there was put in by a previous owner, and what a mess they made. I also found wiring for a CD changer (i assume from Audi as it wasn't hooked up to the JVC), though the changer is nowhere to be found. I cut out some of the wires I knew to be unnecessary, and also tried to tighten up the wiring that was there and loose causing intermittent issues with the passenger door speaker. I also took the time to put the bulbs in place to fix the lighting that wasn't working on the HVAC controls. After hooking everything up I tested out the new stereo setup and it worked great! Just the right amount of bass coming from the trunk of the Audi now. After that I headed off to Pikes Peak International Raceway south of Colorado Springs to check out the SCCA Autocross. I figured the drive down there would be a good test of quality for the quattro, it was. I stopped in Castle Pines to fill up with gas, that is where my troubles started. I couldn't figure out how to get the gas door open, like VWs of the mid 90s the door is tied into the door locks, but the problem was I couldn't get the door locks to go on the Audi, not until I stuck the key in the door, the remove for some reason quit working. The rest of the drive down was uneventful, though when I went to start the car to leave the gremlins appeared again, the turn signals weren't working, the HVAC wasn't working, the lights didn't work. Turn off, turn on, boom it was good again. (I didn't figure this out until I was driving down the highway though, so I did this at 70mph). On the way home things seemed okay, then I noticed the check engine light was on. I stopped in CO Springs and got some lunch, at which point in time I restarted the car, the check engine light stayed off, until the time I got just about home. This evening Natalie and I went to Boulder to see a live recording of the radio show etown, I wanted to go because Cake was playing. I was planning on taking the truck, but Natalie wanted to take the Audi, so we did. Well we didn't get too far before the gremlins started again. I decided to stop at the gas station and check the oil level in the car. I hadn't bothered to do this yet as I planned on changing the oil, but hadn't gotten around to doing that. So I checked it, it didn't even register on the dipstick! yikes, into the station I went for two quarts of oil, it took both quarts to make it "full" on the dip stick. After that the car didn't want to start up right, no lights, no signals, no HVAC. It took a couple of tries gain, but the car started up and I decided we wouldn't head home to get the F250, we'd take the Audi to Boulder. Everything went smoothly, though the CEL did come on again, and the fan started to squeak. After the show the car started right up and we hit the road. We barely made it to the city limits and we got pulled over by a state trooper! I had no idea why, we weren't speeding, and best I could tell all our lights were working fine. It ends up in Colorado they give you two plates, but only one of those plates has "tags" on them, and guess which one I had on the back of the car? The one without, whoops. He let us go on our way, I'll have to swap the tags around in the morning. 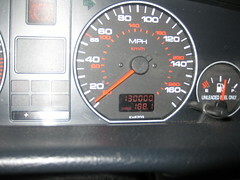 I put around 250 miles on the Audi today, bar the minor electrical issues this car looks to be doing well! I don't know if I'll be able to track down the issues or not, but I'll try to this week.